Faux fur or real - do you know what you're wearing? Fashion's obsession with fur means it's everywhere - luxuriously soft pom-poms perching on top of woolly hats, dangling from scarves and handbags, even hanging off keyrings. But can you tell whether the bobble on your new hat is made from fake fur or the real thing? 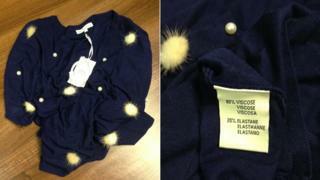 Most embellishments are made from faux fur - synthetic fibres designed to look and feel like animal fur - and sold as such. But the "tragically cheap" cost of real fur means that is not always the case and people who think they are wearing fake fur may not be. There has not been a fur farm in the UK since they were banned in 2003, but it's not illegal to wear fur. Some shoppers however, cite ethical reasons for not buying it. "We know the vast majority of British people don't want to buy fur ethically and morally, but we are seeing an increase in it on our streets,' says Claire Bass, director of Humane Society International UK. "Consumers are being duped into buying real animal fur." She adds: "Fur is tragically so cheap. It can be produced for the same or less than the cost of fake fur." As part of an awareness campaign, the charity carried out laboratory tests on three items being sold as faux fur this winter, and found them to be made of mink, fox and rabbit. Most high street stores have fur-free policies, but adornments and trims from rabbits, dogs, raccoons, foxes and minks are appearing on clothes sold on market stalls, by smaller independent retailers and online. Often the sellers themselves do not know it is real fur, says Ms Bass, and it is assumed to be fake. David, a management consultant from Kent, bought a bobble hat for his 19-month-old daughter from Amazon Marketplace. He and his wife, pregnant with their second child, had seen the cute pom-pom hats at Christmas fairs so when they spotted one online, they clicked 'buy'. "It was £9 so I thought it's got to be fake fur for that price." But, when it arrived, directly from China, their pet terrier "went wild for it", he said. "You can see the skin at the base of the pom-pom, and the hair at the root was fluffy." The labelling held no clues, but a closer look at the small print in the online product description revealed it was raccoon fur. He complained to Amazon that it had been categorised as faux fur, and received a full refund. "We are not fussed about the cost," he said. "It's annoying - the dog goes wild, my wife is allergic to some furs and you just don't want a raccoon pom-pom on your daughter's head." The Humane Society International UK wants to see 100% accurate labelling and description on products, and a ban on all fur imports. "If we consider it cruel to produce it here, we should not be paying fur farms overseas to produce it," says Ms Bass. The charity believes that leaving the EU may be an opportunity for a total ban. Until now the UK - under World Trade Organisation rules - has not been able to ban imports of products still produced by some EU member states. But in post-Brexit Britain the government could write into UK law a ban on all fur, not just cat, dog and seal, as current EU law states. The British Fur Trade Association, which represents the UK's fur sector, supports HSI's call for correct and truthful labelling. "It's a bit curious that anyone would want to hide the fact that they are using this beautiful product [animal fur], that adds luxury and value," the association's chief executive Mike Moser said. He said real fur was more popular in the UK than it had been for decades, citing a study by Copenhagen University which found UK fur sales had doubled in the last five years. The industry was pushing for better animal welfare in European fur farms, he said, and people were beginning to realise that some of the propaganda around the fur trade might not be true. Labour MP Kerry McCarthy said there was "a lot of public concern that we are importing cruelty and that fur can be mislabelled". "Customers have a right to know what they are buying, and want assurances that the UK will not be complicit in such unnecessary suffering," she added. Will welfare checks improve conditions on fur farms?